Citation: Awoyale, Yiwola. 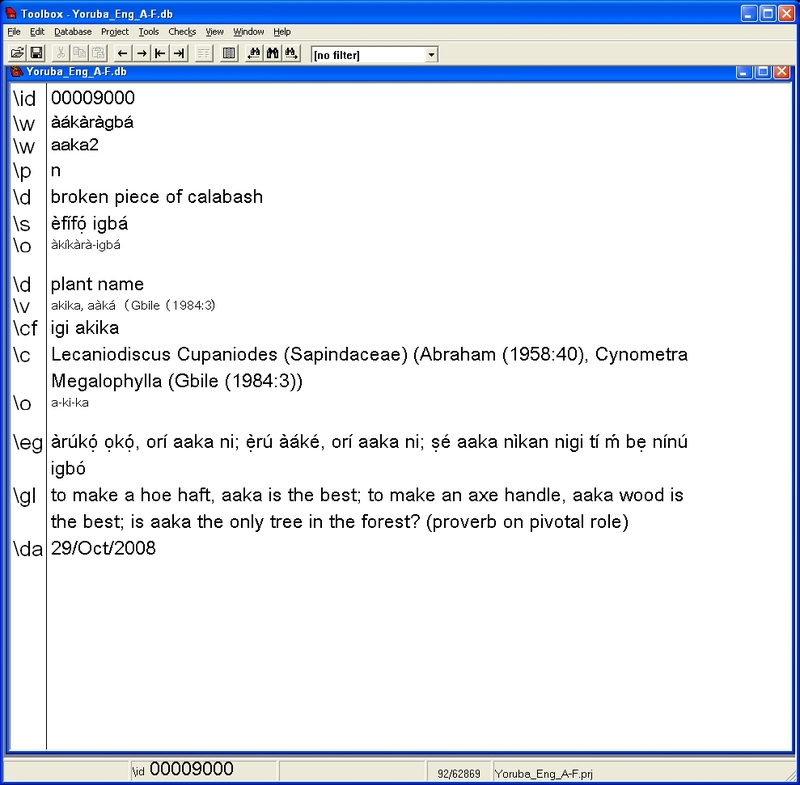 Global Yoruba Lexical Database v. 1.0 LDC2008L03. Web Download. Philadelphia: Linguistic Data Consortium, 2008. The current standard orthography is tone-driven. Yoruba has three tones: a high tone, a middle tone and a low tone. Each syllable in a Yoruban word must have at least one tone and long vowels may have two tones. While there are no explicit rising or falling tones, combinations of the languages three basic tones may produce the same effect. Grammatically, Yoruba is a Subject-Verb-Object (SVO) language. Verbs have no infinitive forms, past or present tense and typically have only a single syllable. Discrete auxiliary words provide information on the verb tense. Nor do Yoruba nouns have plural or singular form their number derives from the context in which the word occurs. The Yoruba dialect continuum consists of over fifteen varieties, with considerable phonological and lexical differences among them and some grammatical ones as well. Peripheral areas of dialectal regions often have some similarities to adjoining dialects. Standard Yoruba is a koine used for education, writing, broadcasting, and contact between speakers of different dialects. It is also called Literary Yoruba, common Yoruba, or simply Yoruba without qualification. Though in large part based on the Ò?yò? and Ibadan dialects, it incorporates several features from other dialects and has a simplified vowel harmony system and some other features not found in other Yoruba dialects. The dictionaries in this publication are presented in two formats, Toolbox databases and XML. Short for The Field Linguists Toolbox, Toolbox is a lexicographical database system published by SIL. SIL makes Toolbox freely available for download. In order to use the Global Yoruba Lexical Database v. 1.0, Toolbox must first be installed on the users local computer. Both the Toolbox and XML presentations encode the text in Unicode UTF-8 using normalized form C. Unicode normalized forms govern the order in which letters and characters are composed and processed by software systems. Normalized form C is the standard form used by most web systems and is a W3C standard for the web. The Toolbox presentation uses the Aria Unicode MS font for display. The Tahoma and Lucida Grande fonts will also display the Yoruba alphabet under UTF-8 encoding. Since XML only provides information about document structure, fonts are not specified in the XML versions of the dictionaries. Displaying non-Western letters:Windows users will need to install and configure their computers for Extended Language support. To do this, open the Windows Control Panel and click the Regional and Language Options icon. In the Regional and Language Options window that opens, select the Languages pane. Under the Supplemental Language Support section, check both check boxes and click okay. Windows will as for your install disc and will install the modules needed to properly display complex and non Western letters. If users do not have their Windows install disc, they should contact their local system administrator to install Extended Language Support. For an example of the data in this database, please review this sample entry (jpg) from the Yoruba-English Lexicon.